A member of the water lily family (Nymphaeaceae), the bullhead lily looks like a flower bud rather than a full flower. It's as if it's just waiting to burst open, but it's not. That's it. There is no more to it other than it is outstanding in its field (water). The familiar floating yellow water-lily of the Northeast. 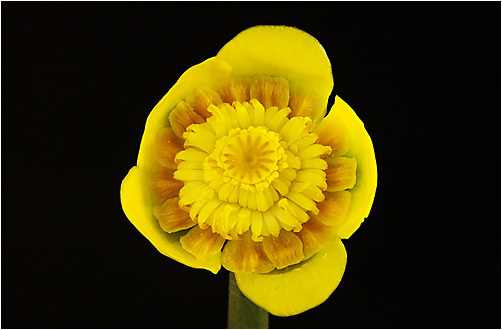 The globular yellow flowers are made up of fleshy sepals; the stamen-like petals are concealed. Note the disklike stigma in center. Leaves with rounded basal lobes, narrow notch. Ponds, sluggish water. 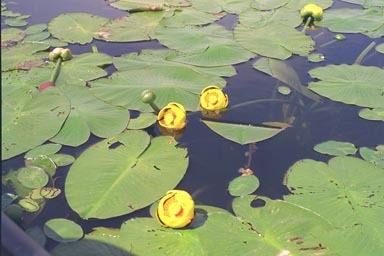 Several yellow pond lilies that were once considered separate species (including Nuphar variegatum, N. rubrodisca, N. microphyllum, and N. advena) have recently been lumped into Nuphar lutea. Nuphar lutea, the spatterdock, yellow water-lily, cow lily, or yellow pond-lily, is an aquatic plant of the family Nymphaeaceae, native to Eurasia. It grows in eutrophic freshwater beds, with its roots fixed into the ground and its leaves floating on the water's surface. The plant's inflorescence is a solitary, terminal hermaphrodite flower, pollinated by insects, which bloom from June to September in the Northern Hemisphere. The flower is followed by achenes which are distributed by the water current. It can grow in water up to 16" deep. Spatterdock was long used in traditional medicine, with the root applied to the skin and/or both the root and seeds eaten for a variety of conditions. The seeds are edible, and can be ground into flour. The root has a bitter flavor, but this bitterness can be removed by leaching the root in water. When properly cooked, an edible starch can be extracted from the root, making it a possible emergency food. Leaves and leaf stalks need to be cooked as well as the seeds. It can be ground into a powder and used in making bread and porridge, or for thickening soups. The seed can also be parched, when it swells considerably, but does not burst like popcorn. It is then normally eaten dry. A refreshing drink can be made from the flowers. Plants For A Future can not take any responsibility for any adverse effects from the use of plants. Always seek advice from a professional before using a plant medicinally. Anaphrodisiac; Anodyne; Antiscrophulatic; Antispasmodic; Astringent; Cardiotonic; Demulcent; Hypotensive; Sedative; Vasoconstrictor. The roots are anaphrodisiac, anodyne, antiscrofulatic, astringent, cardiotonic, demulcent and sedative. Caution should be exercised because large doses are potentially toxic. A tea made from the roots is used in the treatment of 'sexual irritability', blood diseases, chills etc. The root is poulticed and applied to swellings, inflammations, cuts etc. The root contains steroids and is a folk remedy for infertility. Alkaloids in the root are reportedly hypotensive, antipasmodic, cardiac, tonic and vasoconstrictor. The flowers have a brandy-like scent. This unique smell is due to a combination of acetic acid and ethyl alcohol to form ethylacetate. A water plant requiring a rich soil and a sunny position. Succeeds in light shade. It is best grown in still water up to 250cm deep but it also tolerates slow moving water. Prefers shallow water. Plants are hardy to about -20°c. The flowers have a sickly scent. The flowers have a brandy-like scent. This unique smell is due to a combination of acetic acid and ethyl alcohol to form ethylacetate. Seed - sow as soon as it is ripe in a greenhouse in pots submerged under 25mm of water. Prick out into individual pots as soon as the first true leaf appears and grow them on in water in a greenhouse for at least two years before planting them out in late spring. The seed is collected by wrapping the developing seed head in a muslin bag to avoid the seed being lost. Harvest it 10 days after it sinks below the soil surface or as soon as it reappears. Division in May. Each portion must have at least one eye. Submerge in pots in shallow water until established. The related entities and synonyms italicized and indented below are listed by the U.S. federal government or a state. Common names are from state and federal lists. The problem of the plants and the lake, which is only about two acres in size, underscores the complicated balancing act that the county and its many municipalities face in trying to preserve a local abundance of freshwater lakes, ponds and streams. David S. Kvinge, director of environmental planning for Westchester, says Paine Lake, like scores of other small bodies of water in the county, was designed many years ago as part of a plan to control floodwater and collect excess sediment. "'Maintaining these kinds of water resources has been a longstanding problem in the county,'' he said, ''because they need to be routinely dredged -- every 10 to 20 years for a large lake.'' The problem is that dredging has become costly, because silt disposal is governed by strict environmental rules. In 1998, according to Mr. Kvinge, the county began a large aquatic restoration program to improve water quality in various lakes, streams and wetlands that feed into Long Island Sound. To date, he said, more than 30 projects are at various stages, for areas like Echo Bay, the Sheldrake River, the Town Park Pond in Pound Ridge and the Milton Harbor Tidal Wetland in Rye. Paine Lake sits north of the culvert that carries Stephenson Brook to Long Island Sound. 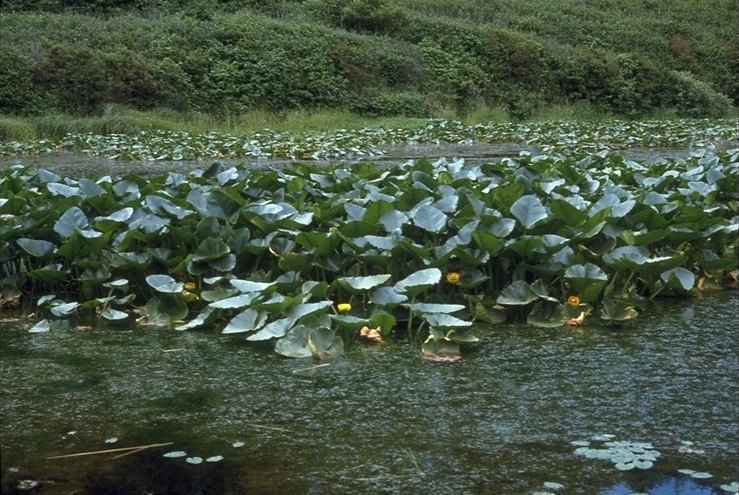 Five years ago the county, seeking to improve the water quality of the brook, hired an ecological restoration company, Creative Habitat Corporation of White Plains, to introduce an assortment of aquatic plants at Paine Lake, mostly around the edge, to stabilize the shore while filtering out potential pollutants like excess nitrogen, which the lilies take up as food. Mr. Kvinge says the county never considered providing maintenance money because it never expected the lilies to grow as aggressively as they have. Such plants rarely grow in water more than six feet deep, and they usually spread slowly. The problem is that they can become invasive in shallower water, and it turns out that Paine Lake is not five to six feet deep at its center, as the county estimated, but more likely two to three feet deep. It was last summer that homeowners around the lake began to notice the plants were overtaking most of the pond surface -- turning an attractive open body of water into a murky swamp. But city officials say Paine Lake will not be dredged anytime soon -- either in whole or in part. Jeffrey C. Coleman, a deputy public works commissioner, said New Rochelle had only just received approval from the State Department of Environmental Conservation to dredge a small portion of nearby Beechmont Lake, which is also badly silted. The approval process in that case took almost two years. Mr. Coleman said the goal for Paine Lake was now to look for an outside consultant, like a landscaping company, that may be able to dispose of the lilies more effectively -- perhaps by using a special mower. Local residents welcome any effort. ''I've lived her for 23 years and the lake was never a problem before, but now it's an eyesore and a garbage catcher,'' said Melanie Riggs, a resident who says her husband, Bruce, often checks for garbage that has become stuck among the lilies. A recent visit to Paine Lake revealed water bottles, juice boxes, a softball and a cigarette lighter trapped in vegetation at one end. Pools of algae were clumped here and there across the surface.